Port Jefferson Dental, PC (Port Jefferson Station) - Book Appointment Online! 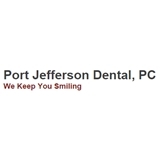 At Port Jefferson Dental, PC, we are always at the forefront of the latest research in dentistry and use the most up-to-date methods and technology to help our patients' achieve their desired smiles. In addition to preventative and general dentistry services, our staff is also trained to perform a wide variety of cosmetic procedures such as veneers, dentures, bridges, root canals and teeth whitening. We are dedicated to providing the highest standard of quality in all dental procedures to ensure our patients complete satisfaction. Using state-of-the-art dental technology, we have been putting smiles on our patients' faces for over 30 years. With experience and training across a broad range of specialties, Port Jefferson Dental, PC is committed to providing affordable quality dental care to the insured and uninsured in a friendly atmosphere. Proudly serving Port Jefferson and surrounding areas, we have been giving our patients something to smile about for over 30 years, and we want to do the same for you.